Whether traveling for leisure or business, The Norwich Inn is your ideal base of operations for Dartmouth and the Upper Valley region or you can just hang out in the Pub and enjoy our handcrafted English-Style Ales. This one of a kind, historic Vermont hotel dates back to 1797 when Dartmouth graduate, Jasper Murdock served his first guest. Just about a mile from Hanover, New Hampshire, this Vermont getaway offers lodging for visitors to Dartmouth College while providing easy access to area attractions and institutions like: Dartmouth-Hitchcock Medical Center, King Arthur Flour, The Montshire Museum of Science, Simon Pearce Glass Factory or local shopping. 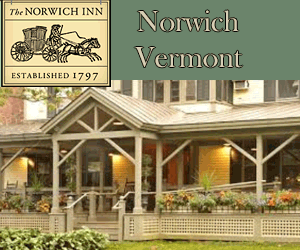 The Norwich Inn features 39 guest rooms, each equipped with free high speed wireless internet access, Jasper Murdock’s Alehouse, Dining Room & Microbrewery, an extensive wine selection and offers a variety of function rooms suitable for meetings, banquets and receptions. Free Parking. Free local and long distance phone calls in continental USA and Canada. Fitness Room. A highly recommended historic Vermont Inn. Ask us about Norwich White River Junction VT Lodging. If you would like to add your Vermont Country Inn, Lodge or Bed Breakfast Inn to this web site, please contact us.